Kerry Henning continues the family tradition of cheesemaking that his father Everett and his grandfather Otto have maintained since 1914. Henning's Cheese is known for their Cheddar and Colby cheese. We are the only maker of "Mammoth Cheddars" in the United States. These wheels of cheese can range in size from 75 to 12,000 pounds. Click here for more information on all of Henning's Cheese Mammoth Wheels. To operate a cheese plant in Wisconsin a licensed cheese maker needs to be on the premise during production hours. Even though cheese plants need a licensed cheese maker they do not need a Master Cheese Maker. The Master's program elevates cheesemakers knowledge and focuses on specific cheeses. Kerry earned his a Masters degree in Cheddar in 1999 then Colby and Monterey Jack in 2002. The Wisconsin Master Cheesemaker® program is the only one of its kind outside of Europe. For cheesemakers, it provides the opportunity to reach the highest levels of their craft. For buyers, it provides unparalleled quality assurance, innovation and expertise. Administered by the Center for Dairy Research at the University of Wisconsin-Madison, the program is open to veteran Wisconsin cheesemakers with a minimum of 10 years experience in Quality Assured plants. Candidates can seek certification for up to two cheese varieties each time they enter the three-year program. They must have been making those specific varieties for at least five years. 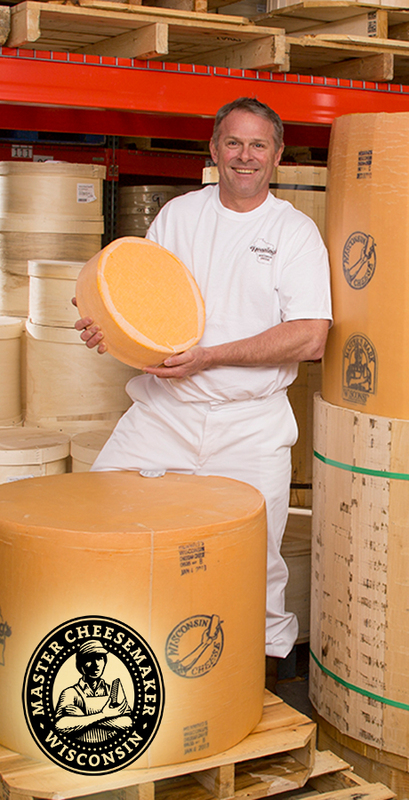 Only certified Master Cheesemakers are eligible to use the Master's Mark® on their product. 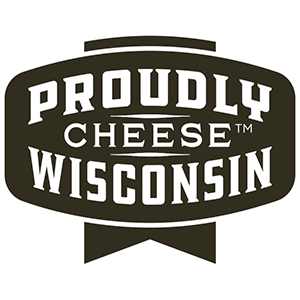 Participants must be active, licensed Wisconsin cheesemakers with at least 10 years experience working at a plant which participates in the Quality Assurance Program. Complete a list of elective courses in Cheese technology, Cheese Artisanship, Cheese Grading, Quality Assurance, Applied Dairy Chemistry and more. Pass a rigorous final written examination which could take up to 40 hours to complete. Yearly evaluations to see if you are staying up to the level required by the course. Since receiving his Master's Cheese degree, Kerry has entered cheese into United States and World Cheese contests and has won numerous awards over the years. Kerry has used his knowledge from the Master's program to create new and exciting flavors. Check out our line of Cheddar, Heritage Cheddar and Colby cheeses to excite your taste buds with some of the best tasting cheeses available. The "Wisconsin Master's Mark" is your assurance that you are buying cheese of the highest quality. 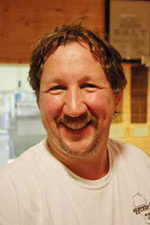 Mark Krutzik has been working for Henning's Cheese since 1990 and has had his cheese making license since 1995. 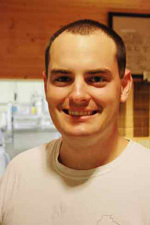 Mark is familiar with all aspects of the cheese making process but his emphasis is on Pasteurization and vat start up. He begins the cheese making process each morning by getting the boiler, pasteurizer and vat preparations ready. Mark's is also in charge of mixing cultures, color and enzymes in the milk along with overseeing the whey separation and cleaning and sterilization of the equipment. Mark is a dedicated employee whose expertise contributes to the high standards set forth by Henning's Cheese. 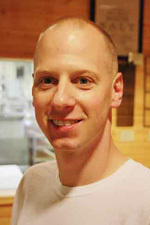 Mike Cieslewicz received his cheese making license in 2010. He has worked on the boiler, pasteurizer and vat prep while also getting involved in other aspects of the cheese making process. Mike has been working for Henning's Cheese since 2001 and is in charge of the waxing, shipping and receiving departments and prepares each order to the specification of each customer. Mike is a dedicated employee who is continuing to expand his knowledge and expertise in all areas of the cheese making process and is committed to the high standards set forth by Henning's Cheese. Joshua Henning has been working full time for Henning's since 2014. Earning his cheese makers license in May of 2014, Joshua now joins the Henning family as the fourth generation family licensed cheesemaker. Joshua graduated from UW-Rivers Falls after serving 4 years in the Marine Corp and has decided to learn the art of cheese making that has been passed down through the family. Joshua has worked in all areas of the business from Start Up to waxing, shipping and receiving. Learning the trade at Henning's requires a thorough knowledge of all areas of the business and Joshua is taking the time to understand each of these areas. Joshua is a dedicated employee who is working on refining his craft to one day manufacture high quality cheeses as did his great grandfather Otto, grandfather Everett & uncle Kerry. Has been working at Henning's Cheese full time since 2014. Zachary earned his cheese makers license in May 2018 and now joins the Hennings family as a fourth generation family licensed cheesemaker. Zachary graduated from LTC - Lakeshore Technical College in 2018 with a degree in Food Manufacturing and Processing. Zachary works in several areas of production including maintenance, sanitation and learning all the areas of business from start up to finish. 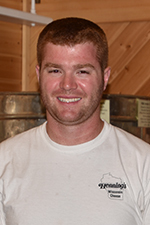 Zachary is a dedicated employee who is working to refine his craft to join the family of quality cheese makers from great grandfather Otto, Grandfather Everett, father Kerry, who is a licensed Master Cheesemaker, and cousin Joshua.